Joe Strummer died on this date in 2002. He reportedly had an undiagnosed congenital heart defect. He was 50. 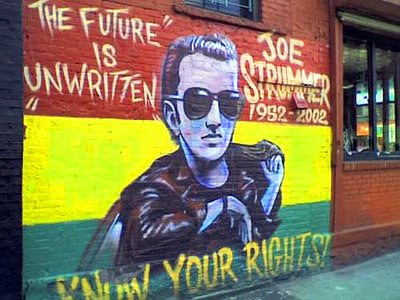 Love the Joe Strummer mural! R.I.P. Here’s to the Joe Strummer mural! Lets’ hope that Joe stays ageless in the EV like the mannequin in the “Time Machine” movie, the one and only George Pal 1960 version. Well, at least until the nuclear apocalypse. Or even more horrifying, NYU expansion. In either case, you know that in the future, the Frat Boys will evolve into the Morlocks. We'll always love you, Joe. Love that mural and agree that it's a comfort...every time I see it, I know that I'm home. Thanks for the coverage. Hate the mural, JS so was so much more than that dorkey cartoonish mural on place that was actually not very punk at all. Blah. JOHN GRAHAM MELLOR u r missed R.I.P.